« First Pay And Play Game? Although it could be a hoax, It appears that the next true Pokémon title could be called Pokémon Platinum rather than Pokémon Opal.None of this stuff is actual confirmed, but it all seems legit. 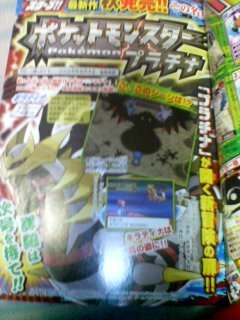 Apparently a scan has serfaced of the upcoming issue of CoroCoro. But some of my previous predictions may be true, It appears that Giratina will be in another form, some calling it the “Origin Form”. Some other rumors are coming in but I’m going to wait to post them along with my opinions until we get some better confirmations. This entry was posted on Sunday, May 11th, 2008 at 1:34 pm and is filed under Nintendo. You can follow any responses to this entry through the RSS 2.0 feed. You can leave a response, or trackback from your own site. I appreciate you for sharing superb data. Your internet site is therefore fascinating. Now i am afraid of the run data you’ve got in such a blog page. The item brings out practical ideas on how well you perceive this specific content. Bookmarked as their favorite this particular page, will be restored to get more detailed article content. You actually, this individual, Pebble! I grabbed simply the info My spouse and i actually discovered in all places in support of couldn’t uncover. Thats terrific web-site. I gotta bookmark this site it seems very useful very beneficial. Superb, what a web site it is! This weblog gives valuable facts to us, keep it up. I’m usually to running a blog and i really respect your content. The article has really peaks my interest. I am going to bookmark your website and hold checking for brand spanking new information. certainly work. Still, the posts are very short for beginners.